Welcome to Campus Connection, where new campus hot-spots and underappreciated organizations get their time in the spotlight. 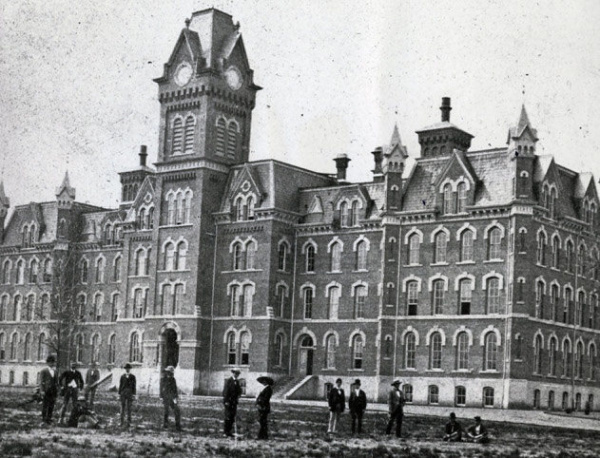 When Ohio State opened its doors in 1873, University Hall was the only building on campus. It served as a dormitory for students, a classroom, and a dining hall. 145 years later, a new University Hall occupies the northwest corner of the Oval. While it may not be as versatile as the original, the building remains the signature landmark of the academic campus. University Hall was the first building on an otherwise barren campus. The multipurpose building with its brick exterior and clocktower was constantly under construction for the first few years of use. University Hall was razed in 1971 after it was determined to be structurally unsafe three years earlier. During the destruction, parts of the clocktower and entrance were salvaged, which are now part of the new building. In the rebuilding of University Hall, architects and engineers made the original exterior as similar as possible to the original. The result? A completely modernized and beautiful brick building that is full of history and character. One look at University Hall is all it takes to love the building. It is one of the most photographed spots on campus and is consistently featured on the Ohio State Instagram page. The brick clocktower on the Oval makes this building among the best on campus. Today, University Hall houses the University Museum, the Arts and Sciences Administration, and a number of departmental offices. The University Museum gives a condensed history of Ohio State, from its founding in 1870 to how many of Ohio State's traditions came to be. The museum is open to the public and is a lesser-known study spot for students.